Stuffed with tips and tricks - you'll roll, press, and mold sushi like a pro! From rolling sushi properly to presenting it with pizzazz, this book has everything you need to know to impress your friends with homemade maki-sushi (rolls) and nigiri-sushi (individual pieces). You'll find over 55 recipes from Tuna Sushi Rice Balls to Rainbow Rolls, plus handy techniques to demystify the art of sushi making - and make it fun! Mineko Takane Moreno, born and raised in Tokyo, received her degree in French literature. Her love of food has inspired a lifelong education in many cuisines, including Japanese, Chinese, French, and Italian. Moving to San Diego in 1973, she began teaching Japanese cuisine, with a specialty in sushi. She currently teaches dozens of sushi classes a year at seven culinary schools, including Macy’s, Williams-Sonoma, and Sur la Table. Mineko consults with restaurants wishing to put sushi and other specialties on their menu. Her culinary work has been featured in numerous print publications and on television and radio shows. She is a member of the International Association of Culinary Professionals. Judi Strada has a bachelor’s degree in Russian studies, which led her to study other cultures through their foods. She was the food consultant and spokesperson for The Sheraton World Cookbook and The Culinary Festival Cookbook and coauthor of The Best of San Diego. She is a frequent cooking guest on television and radio shows on both coas ts. Judi, an award-winning writer, is currently food editor of San Diego Magazine; kitchen garden editor of Garden Compass Magazine; and a member of the Authors Guild, the American Federation of Television and Radio Artists, the International Association of Culinary Professionals, and the James Beard Foundation. She is founding president of Les Dames d’Escoffier, San Diego. Part I: Discovering the World of Sushi. Chapter 1: Embarking on the Sushi Adventure. Chapter 2: Outfitting the Sushi Kitchen. Chapter 3: Getting Familiar with Sushi Ingredients. Chapter 4: Chilling Out with Fresh Seafood. Part II: Getting Ready, Getting Set. Chapter 5: Cooking and Seasoning Sensational Sushi Rice. Chapter 6: Introducing Popular Sushi Types and Techniques. Chapter 7: Slicing and Dicing the Sushi Way. Part III: Rock-and-Rollin’ Sushi Recipes. Chapter 8: Creating Sushi Bar Favorites at Home. 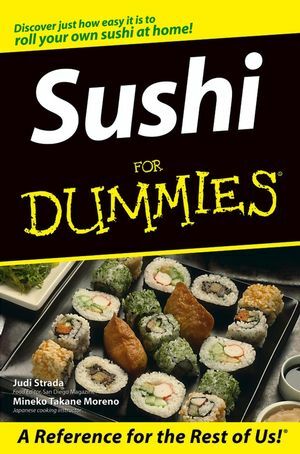 Chapter 9: Quick-and-Easy Sushi: Finger-Snapping Fast Recipes. Chapter 10: Do-Ahead Sushi: Sidestepping the Last-Minute Rush. Chapter 11: Chi-Chi Sushi: Stepping Up to Glamorous Sushi. Chapter 12: Extreme Sushi: Blowing Away the Boundaries. Part IV: Enjoying Sushi Meals at Home and at the Sushi Bar. Chapter 13: Serving Sensational Sushi Sidekicks. Chapter 14: Hosting a Smashing Hand Roll Sushi Party. Chapter 15: Demystifying the Sushi Bar Experience. Chapter 16: Ten Tips for Creating First-Rate Sushi at Home. Chapter 17: Ten Tips for Minding Your Sushi Manners.